The App includes an introduction to the concept of demand response, and it provides a place for you to register interest in our demand response programme. The demand response app is also the best tool to use when you participate in the demand response programme and associated events. 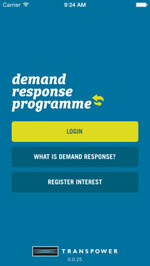 Once you're accepted into the demand response programme, you'll have a login so you can use the app to see all the information about demand response events as they occur. You can use the app to put in a bid to participate in a demand response event, and to be advised if it is accepted. 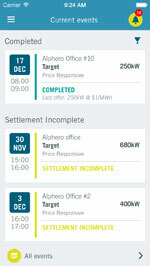 You can send information from the app via email to others who are part of your demand response team – and the app will inform you about how you performed during the demand response event and estimate your payment.